Everybody go to my website http://www.brunazanelli.com, and read our interview which sets out exactly *what has happened to Robin Ellis*. It’s a great story! Thanks for sharing with us! Loved the series! Never to be forgotten!! on January 29, 2014 at 6:20 am | Reply Caroline P.
Great news about making a new Poldark series. But you will be the greatest of course! Robin – would it be impertinent (or, indeed, very nosey) of me to ask when you gave up acting? I think it’s wonderful that people wonder, “Whatever happened to Robin Ellis” — I agree with the above lovely comment that he is living happily ever after”! I also might add that, from my high sensitivities point of view, that Robin and Meredith’s healthy cooking recipes and books, which efforts are such a kindness to others, seems to me in keeping with the type of thing that Captain Poldark would have done, in a way. We all liked Captain Poldark for many reasons, his personal character, his bravery in adventure and his wit, but also because he cared about the welfare of people around him — he did good deeds. And so, yes, it’s nice to think that the entire thing continues! Congratulations on the publication of your new cookery book, and I intend to email the bookseller in England and finish ordering a copy for my daughter’s birthday next month! I realize that I can probably order a copy of it here, but I think that a package from England in the mailbox would be more fun to open! Thanks Nadine for those comments–much appreciated. I hope your daughter enjoys the book. Mixed emotions–to say the least–about the new series . . . . There will always be just one Ross Poldark, one Demelza, one George Warleggan, one Captain McNeil (and, of course, one Jud Paynter) for me! I’ve sent your new cookbook to both of my daughters, and am awaiting my own copy. We are still waiting for Amazon to send your new cook book. We received and update from them, there would be another delay. It is well worth the wait. You are doing a world of good for us all. I think we are going to order Poldark again and watch it for the 3rd time. Best wishes to you to and Meredith. Just from what I think. Huge Fan! Great to see this Article in many venues. 2. What about Robin Ellis: Good Article! 3. 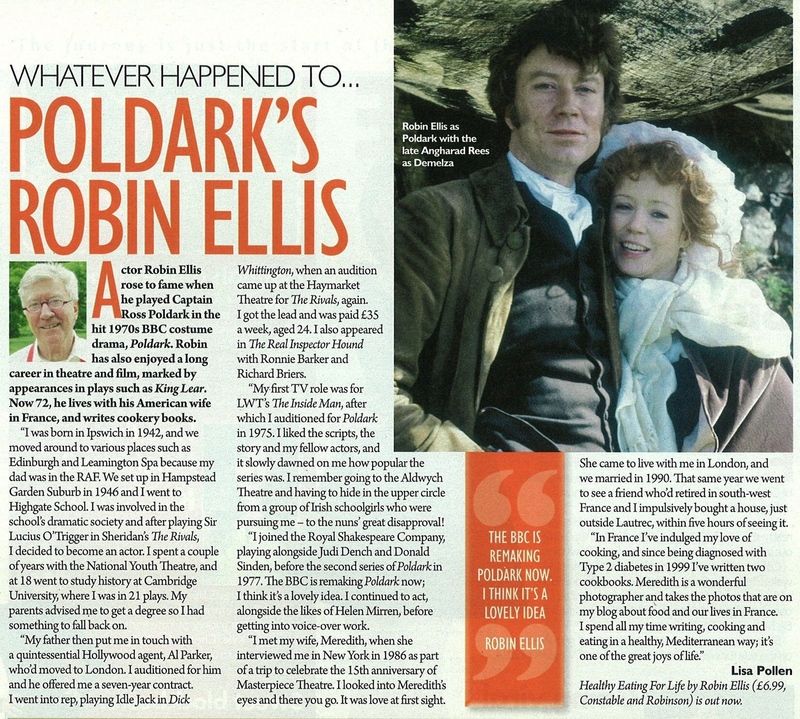 We must have Robin Ellis: Because we are still touched by you and your portrayal in Poldark. Your performance as Ross Poldark cannot be matched…just as Clark Gable as Rhett Butler! There is no other. In Poldark, your commanding voice made others pale in comparison, only adding to the believability of your character’s values and passions. “Twas” only one person strong enough to really stand up to “ee”…Demelza! You gotta love it! I do. 4. We need someone like Robin Ellis: Because you continue to stay in the spotlight with your talent for writing and helping a person enjoy life through cooking and healthy living. A passion for life, and giving…through diet. 5. So it brings us to What Ever Happened To Robin Ellis: Well, as the unforgettable Ross Poldark, Robin Ellis still portrays the enjoyment for living through his cookbooks, Delicious Dishes, Mediterranean Style, and Healthy Eating for Life, and the delight of chopping a simple onion that goes into a wonderful dish that makes us smile, one with another!. Time and again! Thank you for sharing the article. I enjoyed reading it. I to am an avid Poldark fan. My first encounter with the series wasn’t until the mid 1990’s just totally by chance. My local library carried VCR tapes and I was browsing them one day and came across the first season of Poldark. I enjoyed every minute of it and had no clue that there was a second season. I borrowed the tapes numerous times over the years. I found the series on Netflix about a year ago and was introduced to the second season. My fascination with the series is a tad bit personal. I used to do genealogy research, not as a professional, yet. In doing my father’s German side and talking with the few older relatives still living I learned that my great-great grandfather an engineer by profession in Nuremberg married the house maid and within a short time span moved to America with her in the 1873. I often wondered what it would have been like for he and his wife with the class distinctions. The Poldark series and books are giving me a little bit of an idea although from a different country and 100 years difference. I am currently finished the First book of the series, Ross Poldark. Last night I was sitting here watching Elizabeth R. on Netflix while working on some cross-stitch embroidery when I heard that voice of yours. I tend to listen more then watch when I am busy with needlework. I had no clue that you were in that series until I heard your voice and looked up to see you standing there in this very purple colored costume. I have to say the character of Essex was the most polar opposite of Ross Poldark. Your acting was exceptional. Too many actors of today are always the same no matter what role they play. You on the other hand showed you were born to acting like a duck is to water. The characters played are believable and contrast so well that one forgets who the actor is and is instead caught up in the performance. Just as it should be! I do however have to ask you this question. Was that large white collar (from the white costume you wore) around your neck as irritating and uncomfortable as it looked? I do not think I could ever have tolerated wearing something of that nature. I didn’t mind the high collar–it was the tights I found difficult! Yes, I can see how they could be quite problematic. Most women are not too thrilled with them either but vanity seems to override common sense. 🙂 Thank you for your response. This is embarrassing to admit!! But, it seems I’ve missed the opportunity to purchase a copy of your new cookery book from the bookshop in London! They must have sold like hotcakes! It must be the time of year. . . last year the snow held us from catching the train to NYC to your booksigning, and this year, I’ve ‘missed the boat’, so to speak, in terms of buying a copy of HEALTHY EATING FOR LIFE. I can only find a Kindle edition on Amazon, but I’d prefer a hardcopy — could you advise where one can be found for purchase? Thanks! Hi Nadine–the book will be available on Amazon.com in about a week. It’s a paperback though, not a hardback. Oh, that will be perfect! I’m glad to hear it — thanks again! I’m assuming, Robin, that Chevalier’s will have copies for sale in March? Definitely want to support any bookshop astute enough to have you in person! They will for sure, Maureen–see you there! When/where will you be in DC? Need to let my sister know! End of next week–but no location set up yet. Very Well! So you’ll see #15 on or about the first on the East Coast and #14 on the 15th on the West Coast! Can’t wait!